Once inside the Magic Kingdom, head on over to Frontierland to live the story of Brer Rabbit and all his pals. Description: This ride will take you on a pleasant 8 passenger log ride with a BIG ending. The big drop is a over 52 feet long and well worth taking! The good news for people that are unsure about taking the plunge is what you see is what you get. Watch a few others drop into the briar patch before deciding if you’d like to try it out yourself. The music aboard this ride is fantastic as are the audio animatronics. The entire ride clocks in at just over 11 minutes, which is extremely long by Disney Standards! You are likely to get wet, but not soaked. Sit up front for the biggest splash. Tips: Lines build quickly for splash, so it is advisable to use the fastpass system. If you are riding standby, early mornings, during parades and fireworks, and in the last hour of the day will be your best bets. 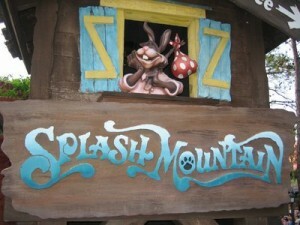 A good frontierland suggestion is to do Splash and Big Thunder Mountain as a pair. Fastpass the attraction that has the longer wait and head on over to the standby line of the other. By the time you are done with your wait on one, you will likely be nearing your fastpass window on the other. If your fastpass return window is still a ways off, check out some other nearby attractions that will have small wait times such as Country Bear Jamboree and Pirates of the Caribbean in Adventureland. The “Mountain” is actually called Chick-a-Pin Hill. There are over 65 audio animatronics on this attractions. Before the big drop see if you can find a very clever hidden Mickey. This entry was posted in Attraction Spotlight, Frontierland, Magic Kingdom, Planning Tips and tagged attractions, facts, fastpass, Frontierland, magic kingdom, rides, Splash Mountain, tips. Bookmark the permalink. Thanks for reading! I appreciate all the feedback! Have a magical day!